This is a porridge bowl: featuring Humphrey B. Bear; star of the Here’s Humphrey! television show since 1965. Humphrey is a partially clothed bear [famously- he wears a hat, waistcoat, collar and tie, but no pants] – who cannot speak. So- each show in the Magic Forest is narrated. Humphrey just has to gesticulate and wildly nod his head to enact his part. But- again- famously- the costume is so heavy that the actor playing Humphrey is actually a trained dancer. Humphrey is now ‘heritage listed’ and a ‘national icon’. He has won a couple of Logies. All without speaking a word. Maybe- just maybe- that is the secret to his success. There are many Humphrey B Bear collectors out there. OK folks, we’re in the Eighties now. I know that’s an unusual period for this blog- but bear with me. This is a ‘Bad Guy’ mug [the best kind, let’s be honest] – he’s a bad cowboy breaking into a safe – his hand is on the dial- : and in the middle of the mug there’s a bag of loot, which you discover once you’ve drunk the poison/liquor/substance held within. Presumably there’s a Good Guy out there- but I haven’t come across one just yet. Fitz & Floyd are becoming very collectible, so if you have any interest in collecting, maybe now’s the time to start. I have featured Fitz & Floyd salt and pepper shakers before- and both sets were snapped up by collectors. Continuing my love affair with Nordic glass, here are two sets of iittala candleholders, with their original candles [c. 1982] and in original boxes [one with lid.] Some of the candles have light discolouration due to age, but the candles haven’t been used -or indeed- taken out of the box. The glass candleholders have their original iittala stickers, and were designed by Valto Kokko Ahlstrom [pattern no: 2659.] They were designed and released Christmas 1982 and the candles came in red, green and brown- for Christmas. I get red and green, but brown? Maybe a Finnish tradition. Hankering for a 4.5 inch analogue TV, AM/FM radio and LCD clock all in one convenient ensemble? Well, look no further. The TCR [TV, Clock, Radio] is for you. 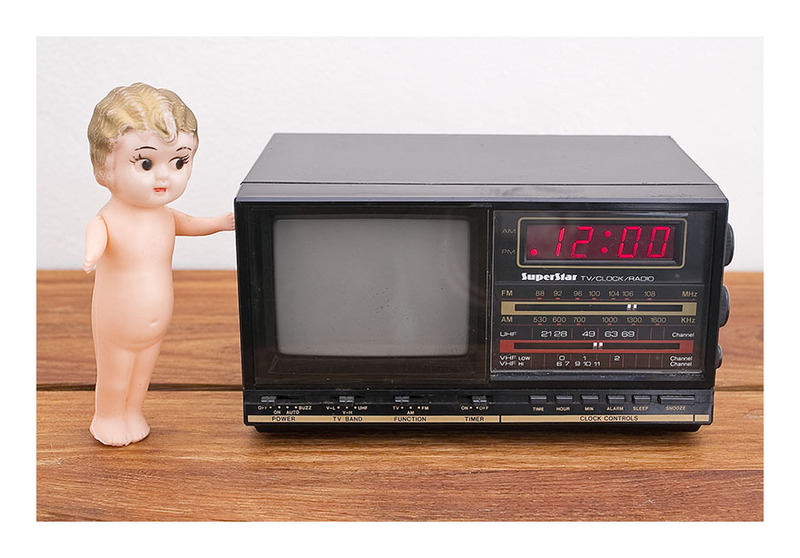 This tiny, all-in-one unit [compare to the size of kewpie doll!] has it all. Sure, the analogue TV is only good for sound, not visuals – since the whole world has gone digital- but the radio and the clock work a treat. And a bit of a tweak by a technowizard will have that TV playing again. And it will totally fit on your bedside table. See the review of this piece on www.radiomuseum.org – and attest for yourself the advantages of a 3 in 1 [circa 1985.] It runs on both AC/DC and batteries- you can take this baby anywhere. My son [Gen Y] likens cross stitch to ‘pixel art’ and I can see his point. He is also my photographer- so as we style my collection for images to post to the blog he lets me know what he likes and absolutely DOESN’T like. He is the child of two designers- so naturally has a firm opinion on my collection. Which I applaud and learn from; I love his interpretation of things made before he was born. I unfortunately lived through the 70s and 80s in Australia- the time that design forgot – and so sometimes have a less rosy view. 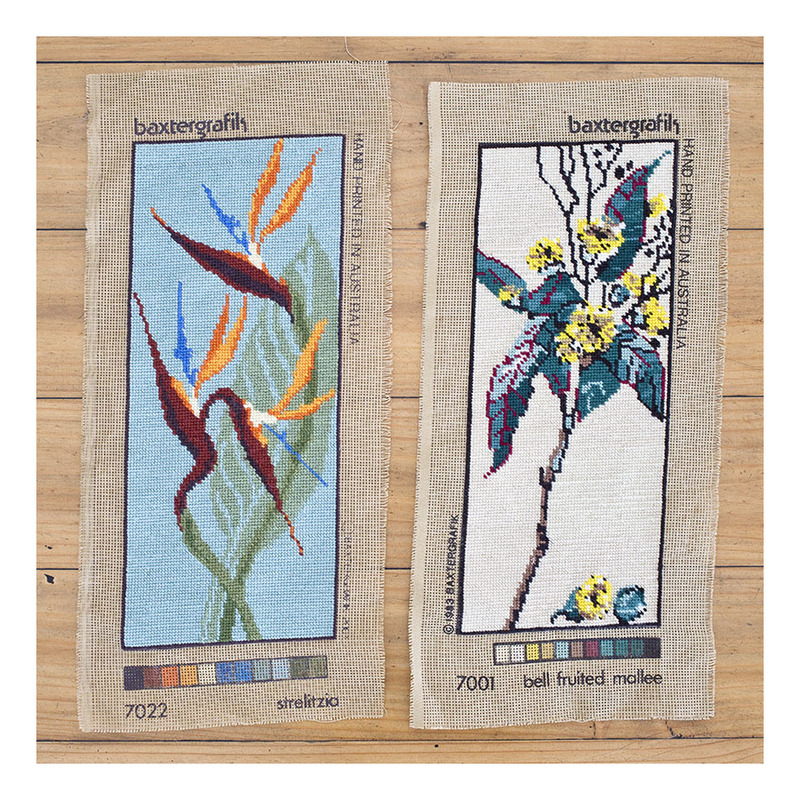 But- I love these tapestries because they are stylized botanical specimens, crafted in Australian wool on hand-printed gauze; Oscar likes them because they are strong graphic representations of pixel art. And I love them for another reason: I have a friend who intends to fill an entire wall of her house with found and reclaimed tapestries; I think these should be included. 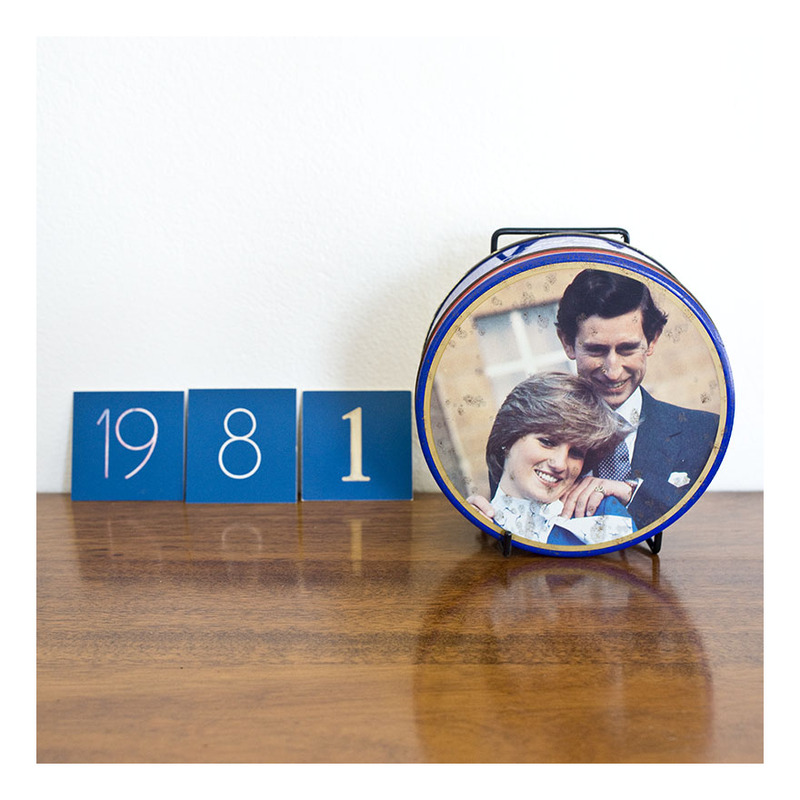 “The Marriage of the Prince of Wales and Lady Diana Spencer, Wednesday 29th July 1981” is inscribed in suitably fancy script on the side of this biscuit tin. Originally holding 1.1lb Petticoat Tail Shortbread, the tin is somewhat worse for wear, with patches of rust on the HRH visages– but I believe amongst the coterie of tin collectors that this is considered okay, and even preferable. I like this image of their HRHs- Diana isn’t looking shy or demure and Charlies looks like he’s starting to see the ridiculous side of life. And though the image is a little tarnished, the lid still fits well and provides a good seal. The cushions are sized to take a 400 x 400mm insert [15.7 x 15.7 inches.] 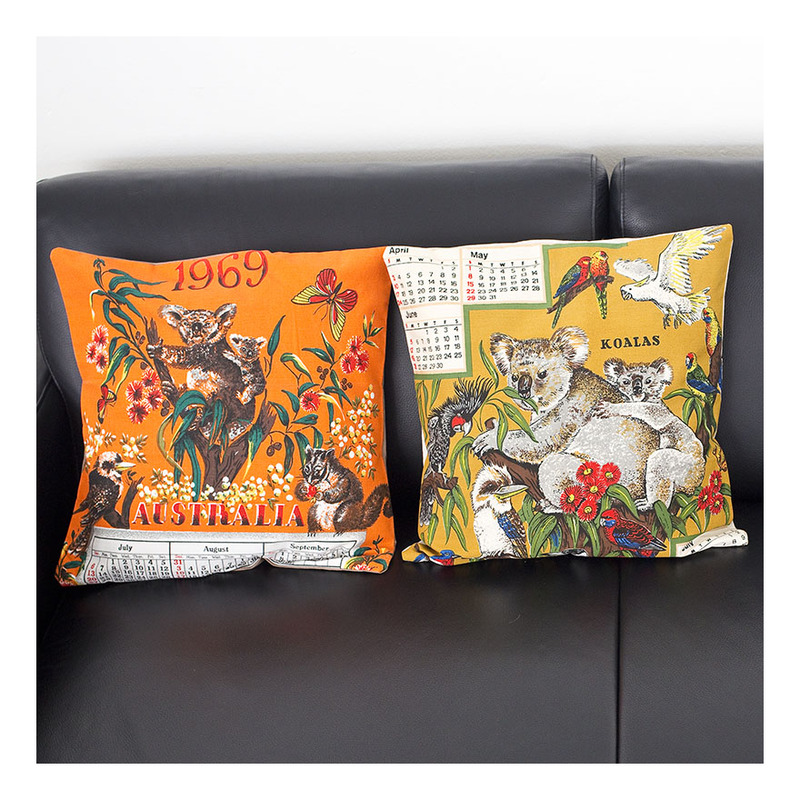 They are fully washable and would make a great gift- especially if the calendar date or koalas in general have a particular association for someone. Think zoo-keeper born in 1969, for example. This tiny, all-in-one unit [compare to the size of the cupie doll] has it all. Sure, the analogue TV is only good for sound, not visuals – since the whole world has gone digital- but the radio and the clock work a treat. And a bit of a tweak by a technowizard will have that TV playing again. And it will totally fit on your bedside table. I am generally not a fan of reproductions. But occasionally, I find reproductions that play homage to the original without trying to pretend to BE the original. Those reproductions I can live with. 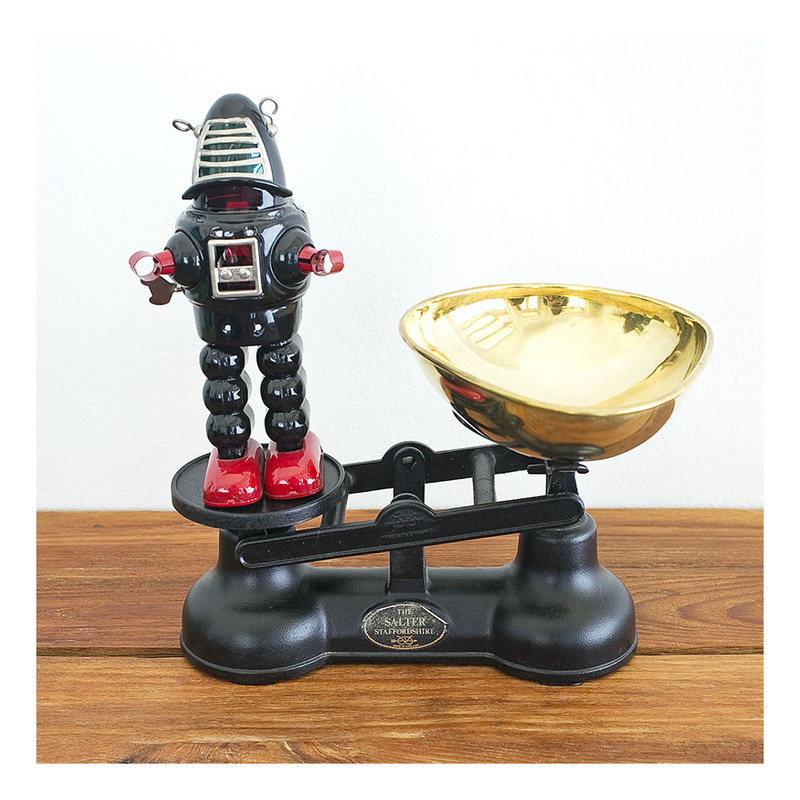 Here we have a Salter scale, cast iron, made to an exact mid 19th century likeness, but with a handy modern addition- that being it’s an accurate weighing machine. I use it for weighing parcels and letters to figure out postage costs – and it looks fabulous on the hall table too. Robbie the robot first appeared in 1956 in the film ‘Forbidden Planet’. Then he appeared as a tin toy, made in Japan, which is now sought after and extremely collectible. Then in the 70s the same maker re-issued the toy [although now made in China!] with a hilarious warning on the box : “For collectors only, not suitable as a toy.” My how things have changed. For that line alone, I think Robbie is worth having around.